Rainfall : two automatic rain gauges (tipping bucket), equipped with data logger for data recording, allowing rainfall recording every 15 minutes, and 4 manual rain gauges, with data collected twice a day and recorded on a daily base. Water Level : one automatic water level station consisting of a pressure sensor and a data logger recording automatically the water level every 15 minutes and 6 staff gauges where water level is manually observed on a daily base. Climate: One automatic Climate station with the following parameters: wind direction, wind velocity, temperature, relative humidity, solar radiation. In addition an evaporation pan has been installed to measure manually the evaporation on a daily base. 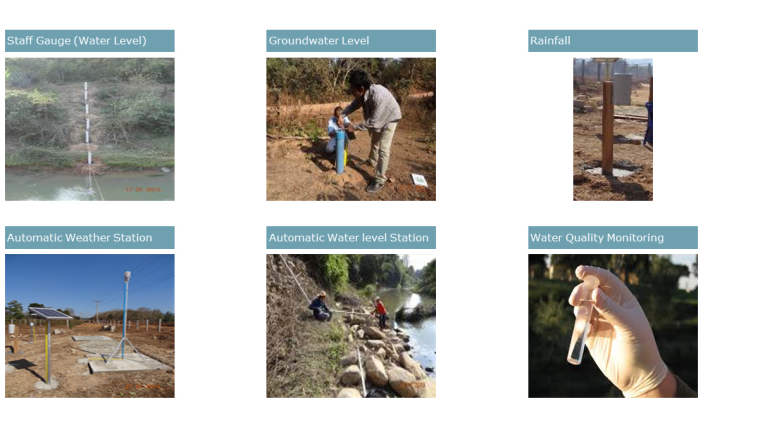 Groundwater: 8 test boreholes have been installed. Water depth in these test boreholes is measured every month by the District Teams.